This is disappointing. Has anyone found out why Google is doing this? 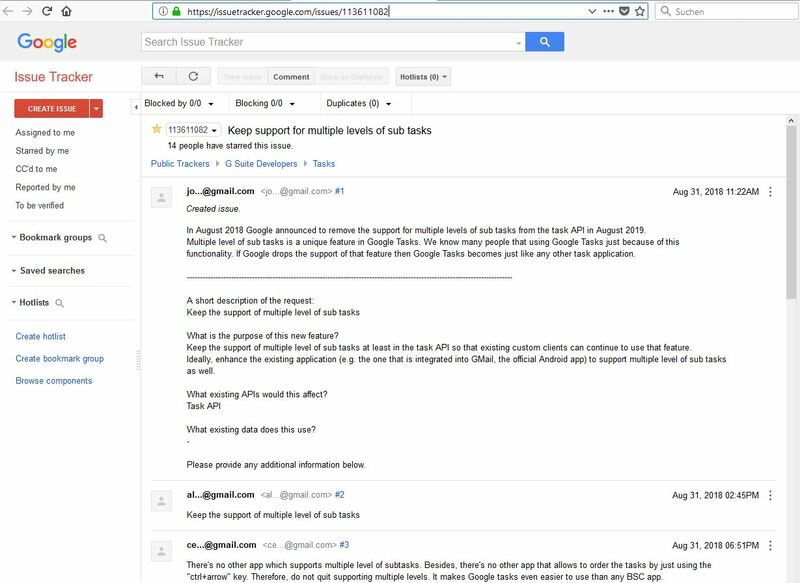 Google’s planned reduction in the functionality of Google Tasks is disappointing, especially for me as someone who uses your product quite heavily, through Google. Is there any way you could make Outliner present the flattened structure stored on the google servers as a full tree? For example, could you add a serial number to each task that would prompt the app to display the task in its proper place in a full depth tree? If something like this could be done, it would allow us to keep using your product to manage our Google data and the extra functionality your product could deliver would make it more attractive to new users. Theoretically it would be possible to add hidden information to fake the level information. But that would not work reliable in all circumstances. Especially when there are different devices and Apps syncing the same Outline. So Outliner rather will also restrict the levels for Google Tasks synchronization. However you can change to any of Outliner's other sync options. Treeline Dropbox is an alternative, which will give you a free desktop Outliner.